Following the August 2 suicide of Hannah Smith, parents have become very concerned about their kids using the popular social networking site, AskFM. The site is in the vein of others like Formspring (which is currently under new management and closed). Founded in June 2010, the site’s purpose is simple enough in allowing users to ask one another questions anonymously. The key to the site’s popularity and overall appeal to others being the anonymous bit. Like most site, AskFM has simple beginnings, allowing users to ask each other harmless questions like “what is the last movie you saw?” or “what’s your favorite YouTube video?” Like all well-intentioned things, the site quickly became grounds for anonymous hate messaging and cyberbullying. AskFM has gained notoriety over this summer as it’s been attributed to a number of European teen suicides. From July to August, the deaths of Daniel Perry, Hannah Smith, Erin Gallagher and Joshua Unsworth were said to have been instigated by bullying on the site. Privacy for the site is basic at best. You have two options: allow anonymous questions or do not allow then. The site also allows you to Blacklist or block users who you do not wish to interact with. I suggest, that if you are going to the site, do not allow for users to interact with you anonymously. This is only going to lead to problems. Most users are just using the site for the reason it was intended. I joined up about a week ago to learn more about the site and just today received a question from a fellow user asking me “What is your one major weakness?” I have the option of answering with text or recording a video response. (For those who are wondering the answer is Mickey’s Premium Ice Cream Bars from Disney world and if I had the ability I’d record me crying tears of joy while eating one in Magic Kingdom!). Users can link their Facebook or Twitter accounts to find friends or search through the millions of users to find questions, answers or new friends. Despite what the media is currently saying about the site, it is possible to report users for inappropriate use of the site. On a user’s page in their questions you will see a downward arrow. Clicking on this bring a drop down menu with the option of reporting the content. That said, what the site does to control, remove or moderate this content, I have no good answer for you there. With 65 million users as of July of 2013, I can’t imagine that it’s easy to moderate every complaint that comes through in a timely manner. I would strongly recommend sitting down and having a very serious conversations with your kids about sites like this. Remember to make it just that, a conversation. If you come in defensive and demanding, your kids will shut down and want nothing to do with the conversation. I also have to say that I can’t help but point the finger at parents in these situations. Yes, Mark and Ilja Terebin (AskFM’s founders) should be doing more to keep their users safe and should rethink the way they are running things over there. Along the same lines, parents need to be paying more attention to the sites that their kids are joining and taking responsibility in keeping them safe. If choose to allow your child to join sites like AskFM, I strongly encourage that you go over the site’s policies and privacy options with them. 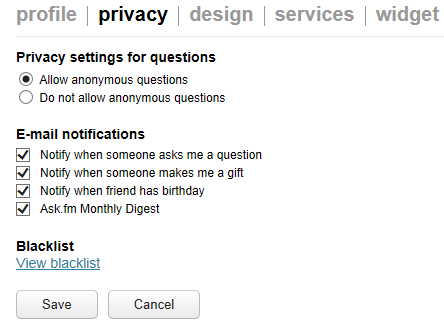 Make it a requirement that they cannot allow anonymous questions and users to interact with them.